When you do this MM automatically pulls in the Mermaid library and renders the chart content using the standard Mermaid Charting syntax. Note that the preview is not rendering all the content correctly which is limitation of the IE control. Markdown Monster's internal preview has only very limited and sometimes incorrect support for previewing Mermaid generated charts due to the Internet Explorer Web Browser control used. You can however preview the document in your external browser using Shift-F12 - all modern browsers (Chrome, Firefox, Edge) can render Mermaid charts properly. 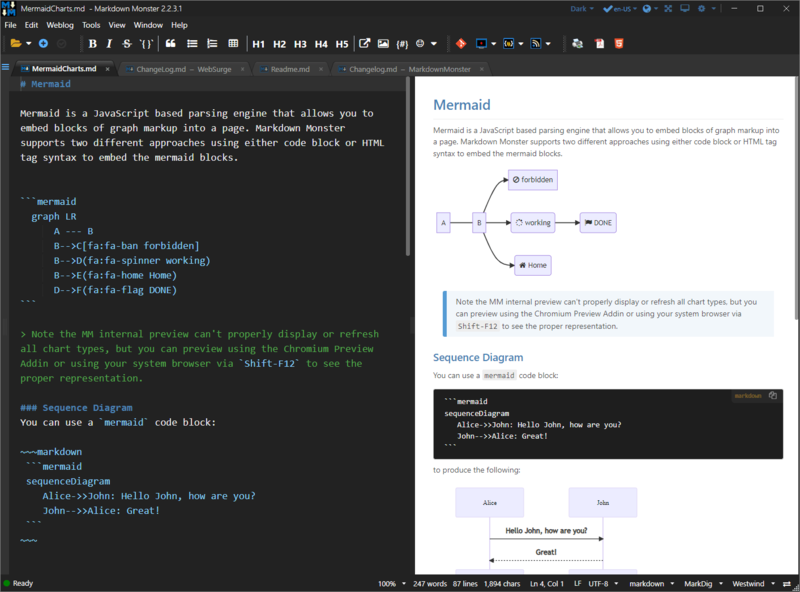 Markdown Monster automatically adds the necessary script to execute Mermaid charts in a page. If you use the Markdown in your pages you will have to add the required script code to your own pages. This will render scripts when the document loads once. The previewUpdated() event here demonstrates how to update, but you'll need to implement your own trigger that causes the preview to render all charts.